5USA is an entertainment television channel in the United Kingdom owned by Viacom International Media Networks Europe. It is a sister channel of Channel 5 and 5*. It was launched on 16 October 2006 as Five US and was the second digital channel in the UK to be launched by RTL Group (the former owner) as part of their multi-channel strategy, the first being Five Life (now 5*). 5USA concentrates on showing imported movies and programmes from the United States. The channel´s original broadcast hours were from 16:00 to 01:00, however it extended its hours starting at 12:00 in June 2007. On 1st November 2015, the channel extended its hours again and began broadcasting from 07:00 until 03:00. The channel changes its programme slots and shows from time to time. 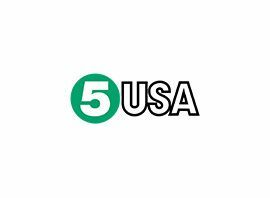 5USA is available on Sky, Virgin Media, Freesat, Freeview and IPTV. British comedian Russell Kane was the ´face of the channel´, presenting short clips between some programmes which acted as space fillers to comply with advertising regulations in the UK (UK regulation allows fewer minutes of advertising than in the US) until 16 February 2009. The music used during the idents until February 2009 was "The Dress Looks Nice on You!" and "Jacksonville" by Sufjan Stevens. On 28 August 2007, Five US launched a timeshift channel named Five US +1 available only on Sky. On 22 January 2009, it was announced that Five US would be rebranded to "Five USA" on 16 February. The channel rebranded for a second time as "5USA" on 7 March 2011. The channel´s highest ratings to date were on 12 February 2008 for the second part of the CSI: Crime Scene Investigation and Without a Trace crossover. The show averaged 2.580 million viewers between 22:00 and 23:00 equating to a multichannel share of 13.9%. Those numbers made the show the most-watched multichannel programme in its slot - beating every other channel (digital and analogue) aside from BBC One, and is currently one of the highest ratings for a multichannel in the United Kingdom.